What did you want to be when you grew up? I wanted to be the first woman president (I thought Hilary Clinton would beat me… looks like I still have a chance), an astronaut to Jupiter, a missionary, a ballerina… I wanted to learn to speak dozens of languages. We all have our own childhood dreams. Somewhere along those lines our dreams at being inspiring, at doing something important, the things we hope for are reduced to our physical appearance. Part of the lie of an eating disorder is that you can’t be anyone or do anything until you accomplish being skinny, thin, and fit. But that obsession leads you to losing everything else that ever mattered to you. 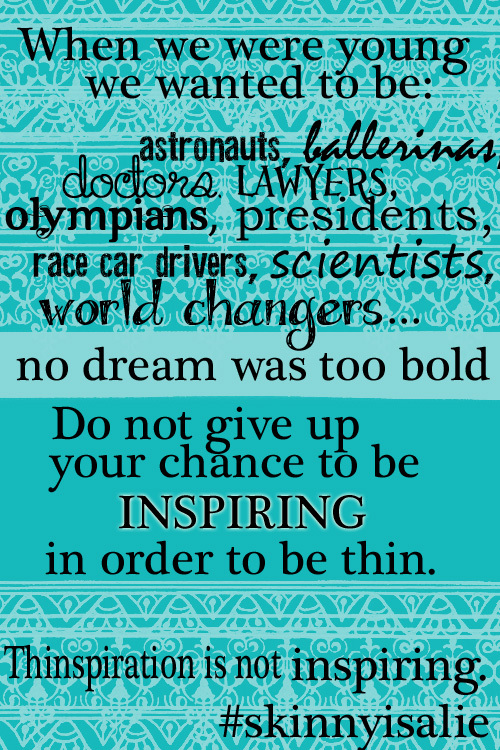 Don’t lose your dreams to be thin. Become inspiration and not thinspiration.